A new directory to be launched in March 2016 will provide easy access to definitive, up-to-date and comprehensive information on businesses dealing with agriculture in Africa. 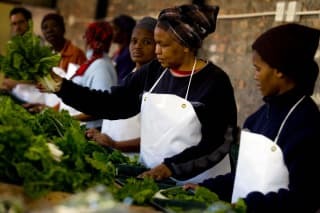 Agriculture and agribusiness in Africa will grow to be a US$1 trillion industry in Africa by 2030, according to a World Bank report, but tracking down agribusiness goods and services in Africa can be a challenge. The African Agribusiness Incubation Directory has been created to overcome this challenge, by allowing the many actors in the agribusiness sector on the continent to upload and update their own information and make it accessible to those who need it. The directory will provide access to definitive, up-to-date, comprehensive information on businesses dealing with agriculture, and detail how clients can access their services. The data will be freely available on a web-based platform. CTA is promoting the awareness of this directory, which is developed by three African groups: the Forum for Agricultural Research in Africa (FARA), one of CTA’s main partners in Africa; the Universities Business and Research in Agribusiness Innovation (UniBRAIN); and the African Agribusiness Incubation Network (AAIN). Potential contributors can register to enlist in the database through an online form. The directory will contain information on company name, type of organisation, country, email addresses and current phone numbers, details of the main contact person, and a brief description of the products and services offered. “The directory is going to be a powerful networking tool where buyers will meet sellers and transact business at minimum cost and utmost convenience,” said Mary Njeri, who is overseeing the project for FARA. Are you interested in agribusiness incubation in ACP countries? Then don’t miss the latest issue of SPORE, CTA’s flagship magazine. It offers an update on support for agro-entrepreneurs – including advice, technical approaches and financing – with a particular focus on women and youth. The magazine is available in print as well as in digital format on SPORE’s new website. We invite you to discover it by visiting http://spore.cta.int. Fully interactive, SPORE enables you to participate in the debate, suggest topics and express your views on agricultural and rural development in Africa, the Caribbean and the Pacific.